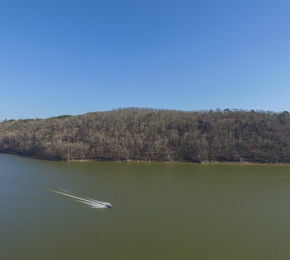 CULLMAN, Alabama (March 30, 2016) – Foreclosed waterfront land on Smith lake, including almost a half mile of shoreline, is being offered at auction, with Pearce & Associates marketing the land and managing the sale. Online bidding for the 223-acre tract is already under way and will end on Wednesday, April 27. “This will be a major opportunity for those who seek to obtain waterfront land on one of Alabama’s most popular lakes for development or personal use,” said Chip Pearce, president and founder of the auction company. Selling in addition to the 223-acre tract are a one-acre waterfront lot in Winston County, three Smith Lake lots in Cullman County’s Lakeshore Estates, three residential lots in Blue Hole Village in Blount County, and 40 acres of rural land in Marion County. The properties are being sold for Premier Bank of the South, in Cullman. “The bank is ready to get these properties off its books and into the hands of individuals and developers who can develop or market the land, creating jobs and tax revenues,” said Pearce. “The 223-acre tract includes not only a lot of great shoreline, but some excellent hunting areas as well in an area known for whitetail deer, dove and wild turkey. It would be ideal for a developer to divide it into home sites, but it also wouldn’t surprise me to see some hunters who want all of this land for their recreational use,” said Pearce. Bidding is taking place at auctionbypearce.com. Those seeking additional information may call 205-664-4300. Pearce & Associates is based in Alabaster, Alabama, with offices in Huntsville/Decatur, Mobile/Gulf Shores and Montgomery/Dothan. The company markets real estate, equipment, vehicles, business assets and estates primarily in online auctions.